Special climbing shoes make standing on small bits of rock a lot easier! They are designed to be tight fitting (like a sock) and have a rubber sole that sticks to rock really easily. 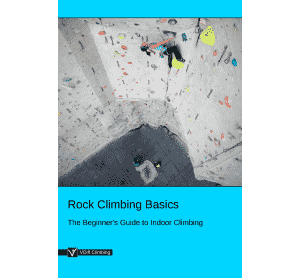 There are many types of climbing shoe on the market. To get the best fit, you should try a few different pairs on before you buy. Look for something that's quite flat and stiff soled. If it's too downwards bent ('aggressive') they'll probably make your feet hurt. These are designed for much harder climbing than you'll be doing to start with. Really flexible shoes will also be painful on your feet. Pick something stiffer until your feet get used to balancing on the end of your toes. 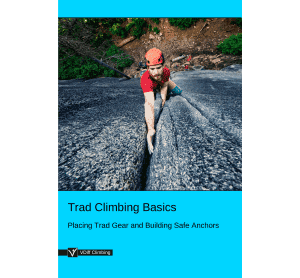 Climbing shoes come with different fastenings – lace up, velcro or elastic. Just pick whichever you like – lace up or velcro offers the most adjustment. Which size you buy is also important. It will feel strange to wear such tight shoes to start out with. 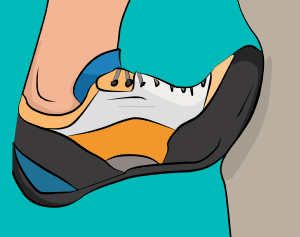 Pick a size where your toe is snug into the end of the shoe, but not crunched up. 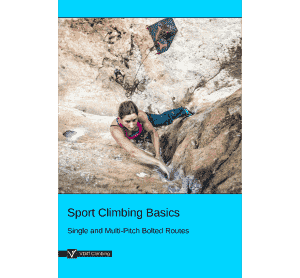 Climbing shoes are sized just like normal shoes, but different brands tend to fit differently. Just start trying on whichever size you would normally wear and go up or down from there. If you shop online, make sure you know exactly what size and type of shoe you need. 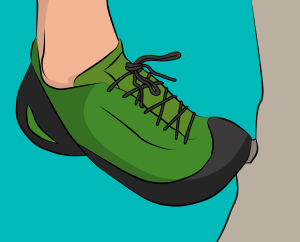 Most climbers prefer to wear shoes without socks, for increased sensitivity. This can cause your shoes to smell terrible after a while. Don’t leave sweaty shoes buried in your bag for days – air them out after each climb and use shoe fresheners when you store them. 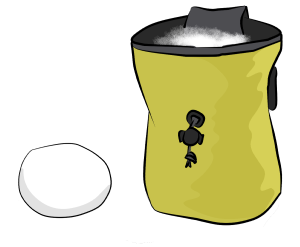 Most climbers use a chalk bag and chalk. The chalk is used to stop your hands getting too sweaty to hold on to the rock – just like gymnasts use. Chalk is available both loose and in a 'chalk ball' – contained in a small mesh bag. Using a ball is easier and less messy to start with, and many indoor walls don't allow loose chalk. You'll also need a chalk bag to put it in. This is a small bag with a draw-cord closure at the top that you can dip a hand into to 'chalk up'. You can either attach the chalk bag to your waist with a piece of cord or a webbing belt. 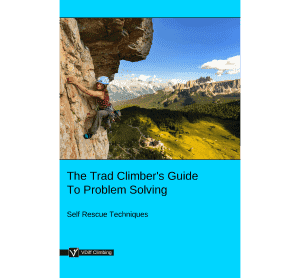 Alternatively, clip it to the back of your harness with a carabiner.